Yesterday’s big news in the world of chatbots was Google acquiring Api.ai, a company which allows developers to integrate natural language processing and understanding into their applications. Think of it like talking to someone, but instead, that someone is now your phone, and it actually understands what you’re saying. Services like Api.ai and Wit.ai are capable of processing human speech patterns and filtering useful data like intent and context from it. Now that Api.ai is owned by Google, the battle between Api.ai and Wit.ai will probably intensify, as Wit.ai has been Facebook’s property since January 5th of last year. In this article, I will describe the outcome of an independent test I ran last week, without any knowledge of the acquirement of Api.ai by Google. It should provide a semi-realistic scenario for the bots and their capabilities at the moment. The purpose of these entities is to provide additional data, next to our intent. 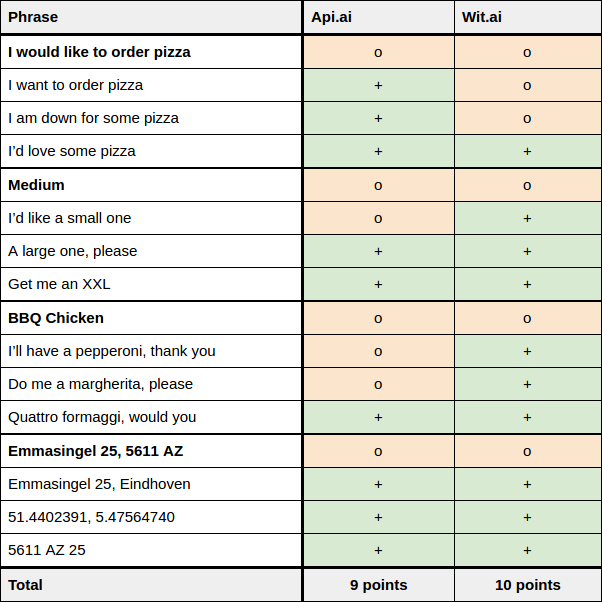 Imagine you want to order a pizza from a bot, you can simply walk through every step in the process, but giving a compound answer would be way faster. Something like “I’d like a large barbecue chicken pizza” not only gives us your intent, but also the size and type, making a separate step no longer necessary. As you can see, pointwise, they are pretty close, but both have their respective pros and cons, which are mostly down to their base functionality and accuracy of their provided entity models. If you were to ask me, right here, right now, which of the two is my favorite, I would say Wit.ai. It has a bit of a learning curve to it but other than that, it’s great, especially for the integration with Messenger, which is our target platform. This, of course, is no surprise as Wit.ai was bought by Facebook for over a year and a half ago. Out of the box, the support for compound answers is way better than Api.ai and they have a good system of building conversational bots, for which you can even write plugin code. We chose Wit.ai for our project but your project may be very different. I encourage you to setup a test like this one for your specific purpose and come to your own conclusion. 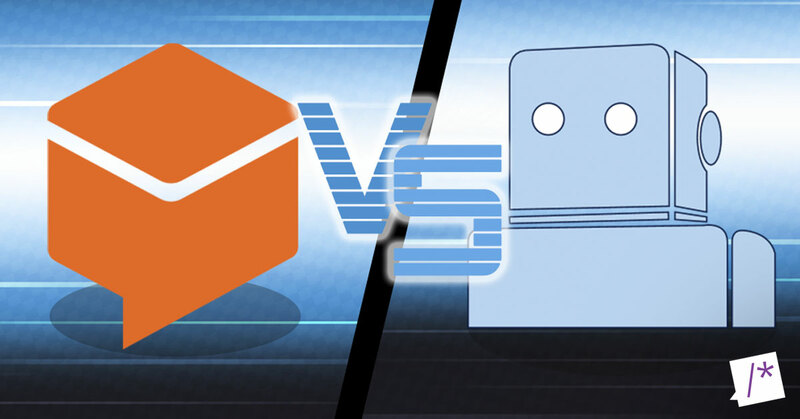 Both of them will probably undergo significant improvements to try and get the larger market share as both are owned by big tech companies and now that chatbots are on such a rise to power.